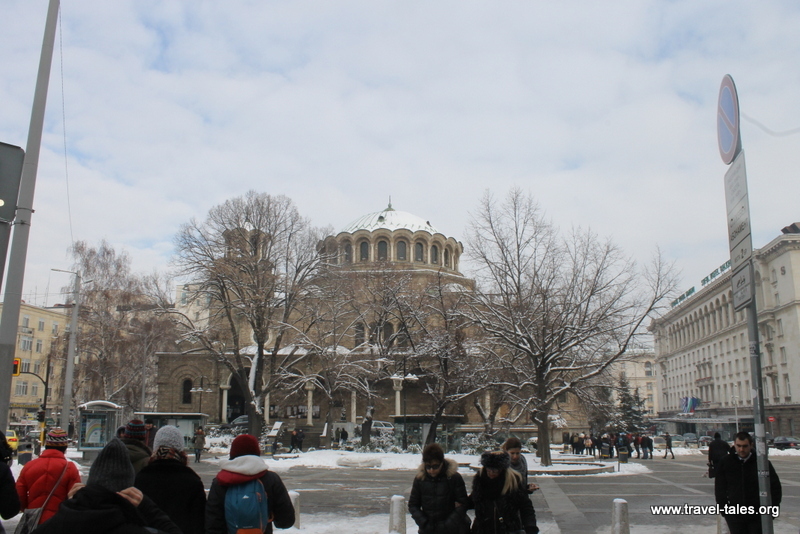 This is not a tour to free a captive Sofia, rather it is a free walking tour around the city of Sofia. You may recall, my visit to Sofia was in January and only morning I had available for touristing was a Tuesday. I duly went along to the designated meeting point in front to the Palace of Justice at 11 am. I expected to be alone, and to my surprise, there were loads of people milling about waiting to be guided around Sofia. On a cold Tuesday morning in January. I may have been surprised, but the guides definitely weren’t, there were three of them, who deftly split us tourists into 3 groups of about 20. Each group got a brief introduction into Free Sofia Tours and the history of the city at different points in front of the palace and then each group headed off. My guide, Vicky (on the left above) then took us to the Sveta Nedelya Church. The church is significant now as a cathedral in the Eastern Orthodox church, as well as being the scene of an assassination near miss in 1925. On 16 April that year, the Bulgarian Communist Party tried to assassinate the king of Bulgaria, Boris III during a funeral of a general. Unfortunately for them, Tsar Boris III was not there, unfortunately for those who were, 150 people were killed and 500 injured when the roof was blown up. Now there is a plaque to remember the victims of the terrorist attack by the Communist Party. From one medieval church we walked to another, which wears its changes over time on its walls. It retains its ground level from its origins despite the city’s pavement level rising over the centuries. It has been re-built numerous times and is now accessed from an underpass that also serves as the entrance to an underground station. From here we walked to our first indoor experience. As the Free Sofia Tour is free, most of the sights are only seen from the outside so as not to have to pay entrance fees. However this next grand building is free to enter and exit. And completely empty. Despite being a shopping mall. Built in the Soviet era it is very grand, but few shops are prepared to pay the rent, so most of the outlets are vacant.